BleachHouseLibrary.ie: Exclusive! New Cover reveal for Jill Knapp's "What happens to men when they move to Manhattan?" Exclusive! New Cover reveal for Jill Knapp's "What happens to men when they move to Manhattan?" Amalia thought she had everything she wanted – a new apartment in Manhattan, a first-rate education at NYU, a group of fabulous friends and Nicholas, a boyfriend who she once believed was her soul-mate. But somehow, it isn’t enough. Stumbling through her relationships, Amalia encounters Michael. An attractive classmate who quickly moves from being one of her close friends, to an inconsistent friend-with-benefits. After all, the only thing consistent about New York is its beauty. Amalia is essentially torn between two men, and Michael is torn between two women. Her best friend Cassandra is being strung along by her "boyfriend", Bryce, and even her friend Olivia is having a secret relationship! 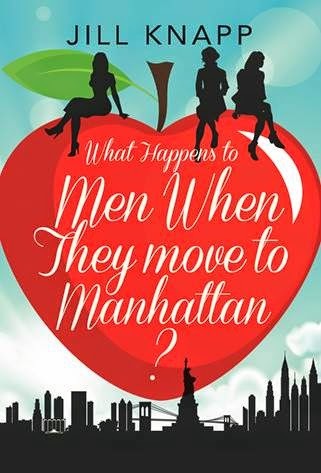 After getting hopelessly lost searching for love in all the wrong places, Amalia finds herself asking – what happens to men when they move to Manhattan?! Loving that cover! :D And as a fellow HarperImpulse author I'm wishing Jill loads of luck with this book! It looks - and sounds - FABULOUS!